Design and CAD Drawings – Canadian Rack Inc.
Canadian Rack designers and engineers specialize in material handling logistics and provide intelligent, real world solutions to warehousing, manufacturing and distribution challenges. We use the latest in Computer Aided Design (CAD) to plan and design your warehouse storage system. 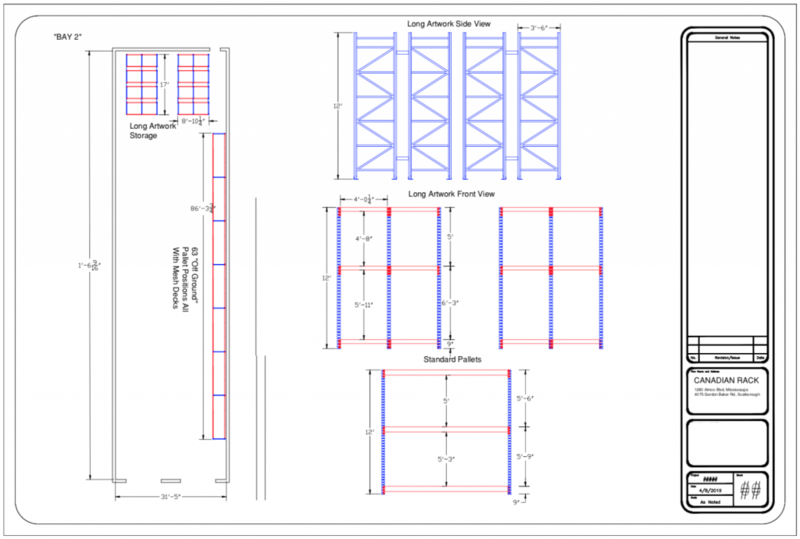 Whether we are implementing full warehouse pallet racking and picking systems or a small scale shelving project, CAD software ensures that the project is designed with your budget, facility measurements and project requirements in mind. Our talented and experienced team of designers use CAD to provide you with initial layouts, detailed plans, prototype testing, and fabrication drawings along the way of the project‘s life cycle. Canadian Rack can produce CAD drawing very quickly, usually within 24 – 48 hours.